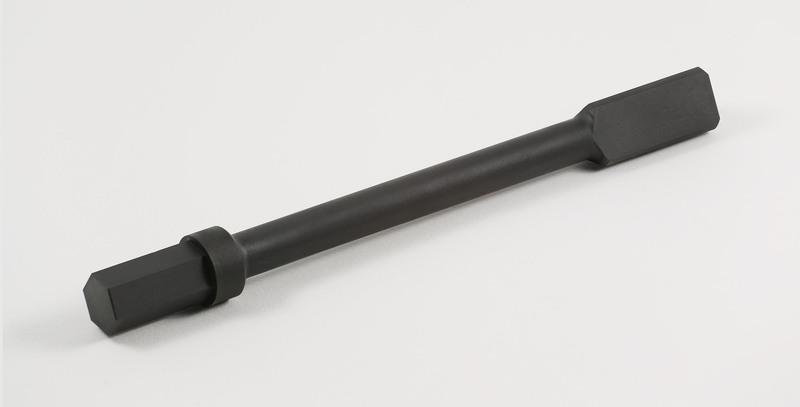 The TRG Action Wrench facilitates barrel removal for the Sako TRG-22/42 rifles. Now you can turn your TRG into a “switch-barrel” rifle with this wrench and a barrel vise. Gunsmiths can use this for barrel replacements and avoid fabricating their own wrench. This is one of the first and only action wrench available for the TRG rifles. It is intended to be used by those qualified to remove and install rifle barrels. The TRG Action Wrench is a solid piece of Stressproof steel, cut into the same triangular shape as the TRG bolt. Our wrench acts on the raceways of the action to minimize any torsional stress induced during barrel removal. Cut into one end of the wrench is an interface for a six sided ¾” or 19mm socket wrench. Note: TRG barrels are screwed on extremely tight. A barrel vise with more clamping surface/force than the common Wheeler vise may be necessary for initial barrel removal along with heat applied the joint. After initial removal, simply dial down the torque a bit when installing the new barrel if a switch barrel configuration is desired. Caution: Always check headspace of freshly installed barrels before firing. Use: Remove optic, bolt, and cheekpiece from rifle. Insert action wrench in same manner as inserting bolt. Clamp barrel and use ¾” or 19mm socket to turn action. Stressproof steel with Mil-spec Manganese Phosphate finish.